This year the National IT Competition for Youth with Disabilities was held on May 6, 2017 at the University of Asia Pacific. This competition was arranged by Govt. ICT division and Bangladesh Computer Council (BCC). 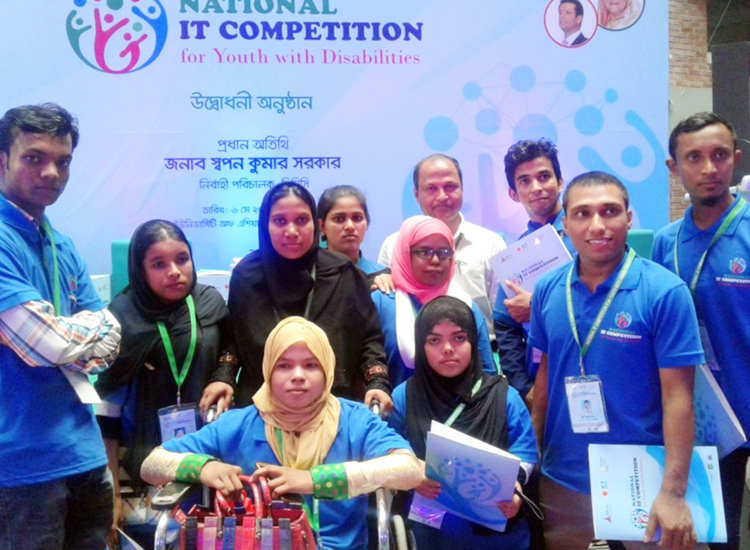 Four categories of Persons with Disabilities (PWD) participated in this competition: Physical, Visual, Speech Impaired and Neuro Development. Among the total of 81 participants from the whole country, nine trainees were from CRP’s Madhob Memorial Vocational Training Institute. A jury board selected the best three from each category and under the physical disability category two of CRP’s trainees were selected. They received a crest, a certificate, a smartphone and 34,500 taka cash each. Amongst the winners there is the opportunity for four to attend the upcoming international ICT competition in Vietnam.